Lumbar spinal stenosis is a degenerative condition (although there are some congenital spinal stenosis cases) that causes narrowing of the spinal canal. Effective spinal stenosis exercises include Clinical Pilates, as this type of Pilates is physiotherapist led. The white structures are the vertebrae (bones). 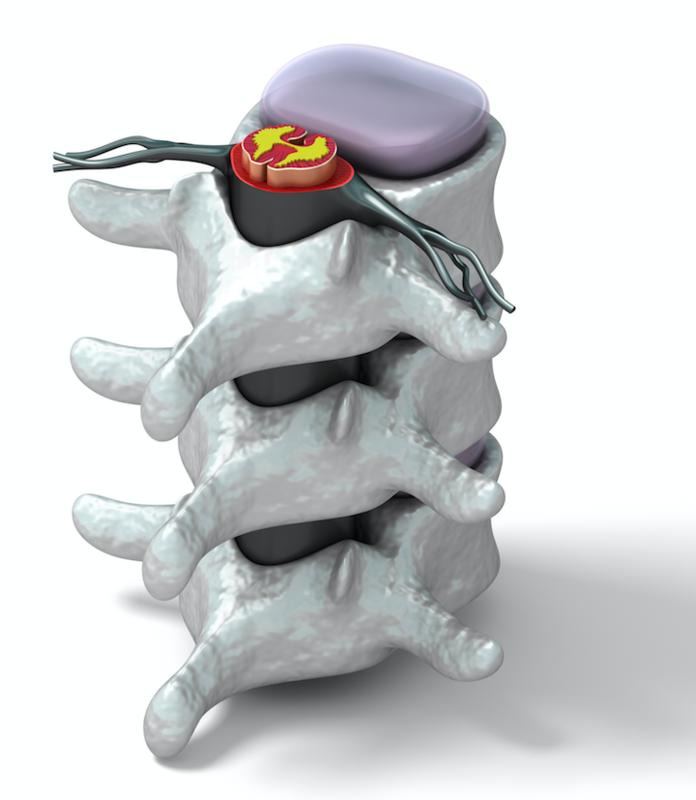 The purple structures (seen at the top) are the intervertebral discs. The black structure running through the centre of the vertebrae (spinal canal) is the spinal cord. As you can see at the top, the nerve roots exit the spinal cord in between the vertebrae. These nerve roots exit between each level. Between each vertebra you have a set of facet joints at either side. Degeneration of the facet joints causes them to thicken and can also cause bony spurs to develop. Degeneration of the discs can also occur. These can both cause narrowing around the space where the nerves exit (nerve roots) and centrally at the spinal cord. This is what is referred to as spinal stenosis. Symptoms of lumbar spinal stenosis are pain in one or both legs (depending on where the narrowing is). In more severe cases of compression, symptoms such as weakness in the legs, numbness and tingling can be reported. People with stenosis will often find their symptoms ease by bending forwards, as this opens up the space around the nerve to give some temporary relief. They will also find walking difficult as this causes the lumbar spine to extend and causes more compression. Walking up hill tends to be easier (as you lean forward) but walking downhill can be worse as your back extends. People will often say that they find it easier walking round the supermarket with a trolley as they can lean forwards onto the trolley and reduce compression. It is important that if you have any of the above symptoms you seek medical advice. Treatment will depend on the severity of the problem. Surgery may be considered in severe cases. A physiotherapist would advise on spinal stenosis exercises to help such as flexion based exercises and core stability retraining to strengthen the muscles that support the spine. We have developed a specific programme of Clinical Pilates workouts to help with this problem. If you decode to sign up to our free trial you will fill in a health questionnaire to allow us to tailor make you a programme of workouts designed for your problem. Please see Pilates for lumbar stenosis.